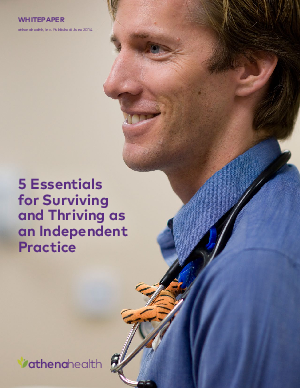 It is harder than ever to run a successful independent medical practice. As value-based reimbursement becomes more common alongside the fee-for-service model, physicians will be on the hook for demonstrating clinical outcomes and providing seamless care coordination in order to receive payment. At the same time, practices must figure out how to meet complex mandates such as Meaningful Use, prepare for an influx of newly insured patients, and handle a rising proportion of self-pay patients— all while providing excellent patient care. Practices without a strong foundation may be unable to decide their own course through these changes and may find themselves financially unstable or having to merge or sell to a hospital.